LA JOLLA, California, September 7, 2011 (ENS) – Starting with normal skin cells from endangered species, scientists with The Scripps Research Institute have for the first time produced stem cells from these species. They say such cells could improve reproduction and genetic diversity for some endangered species, possibly saving them from extinction. Stem cells also could improve the health of endangered animals in captivity. Stem cells have the potential to develop into many different cell types in the body during early life and growth. In many tissues they serve as an internal repair system, dividing without limit to replenish other cells as long as the person or animal is still alive. When a stem cell divides, each new cell has the potential either to remain a stem cell or become another type of cell with a more specialized function, such as a muscle cell, a red blood cell, a brain cell, an egg or a sperm. 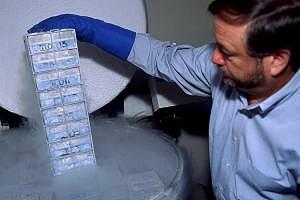 Oliver Ryder, PhD, the director of genetics at the San Diego Zoo Institute for Conservation Research, had already established the Frozen Zoo, a bank of skin cells and other materials from more than 800 species when he contacted Jeanne Loring, PhD, professor of developmental neurobiology at Scripps Research to discuss collecting stem cells from endangered species. Dr. Ryder thought stem cells from endangered species might enable lifesaving medical therapies or offer the potential to preserve or expand genetic diversity by offering new reproduction possibilities. When Loring’s team met with Ryder in early 2008, they realized that a new technique that turns normal adult cells into stem cells might work for endangered species. Called “induced pluripotency,” the technique works when scientists insert genes into normal cells that transform them into stem cells. Ryder suggested two species to begin the work. 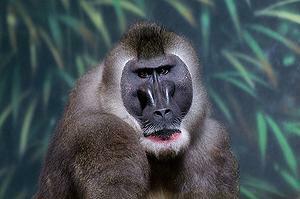 The first is a primate called a drill, Mandrillus leucophaeus, a monkey closely related to the baboons and to the mandrill. Displaced by logging of their rainforest habitat, drills are among Africa’s most endangered mammals. In the wild, drills are found only in Cross River State in Nigeria, in southwestern Cameroon and on Bioko Island, part of Equatorial Guinea. Ryder chose the drill because of its close genetic connection to humans, and because in captivity the animals often suffer from diabetes, which researchers are working to treat in humans using stem cell-based therapies. The northern white rhinoceros, Ceratotherium simum cottoni, was the second candidate. Ryder chose this animal because it is genetically far removed from primates, and because it is one of the most endangered species on the planet. There are only seven animals still in existence, all in captivity. Two of them reside at the San Diego Zoo Safari Park. The northern white rhino formerly ranged across northwestern Uganda, southern Chad, southern South Sudan, the eastern part of Central African Republic, and northeastern Democratic Republic of the Congo. Poachers reduced their population from 500 to 15 in the 1970s and 1980s. 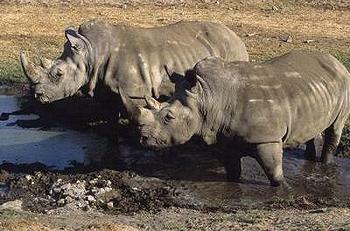 The last surviving wild northern white rhinos were located in the DRC’s Garamba National Park. Their planned relocation in 2005 to a wildlife sanctuary in Kenya did not occur because the animals were killed by poachers. One of the greatest concerns with small populations such as the northern white rhino is that even if they do reproduce, which has not happened in many years, their genetic diversity is inevitably low, and such inbreeding leads to unhealthy animals. After a year of trial and error in the lab, the researchers found that the same genes that induce pluripotency in humans also work for the drill and the rhino, and they have the start of a new zoo – the stem cell zoo. Researchers now are moving toward inducing stem cells to differentiate into sperm or egg cells. With that accomplished, one possibility is that scientists could take skin cells in the Frozen Zoo from long dead animals, change normal skin cells into stem cells, trigger differentiation into sperm cells, and then combine these with a living animal’s eggs through in vitro fertilization. Genetic diversity would then be reintroduced into the population, making it healthier, larger and more robust. Or, the scientists say, both eggs and sperm might be produced from the stem cells, with the resulting embryos implanted in live animals, a process that current research suggests could be much more reliable than existing cloning techniques. Loring said the research team hopes to produce stem cells from other endangered species to expand their stem cell zoo. For now, they’re working to secure funding for this unconventional line of research. Other scientists are exploring the possibility of producing sperm and eggs from stem cells as a potential solution to human infertility. Loring hopes that some of these researchers might consider initial technique development using stem cells from endangered species. The research appears in an advance online edition of the journal “Nature Methods” dated September 4, 2011.